Our recent film ‘Penalty’ is making its way round film festivals, and doing rather well, if you’ve read the previous blog. So until the film fest season is over, we can’t put it on our YouTube channel for all to enjoy. 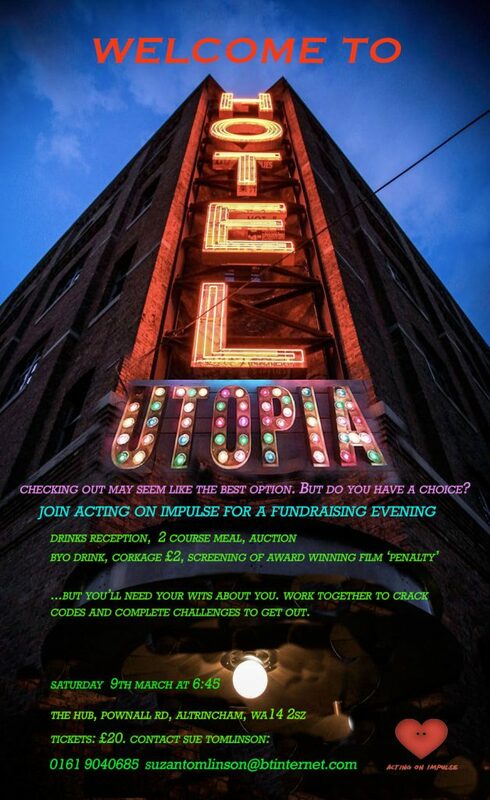 The good news is…..if you come to our biennial fundraiser on 9th March, you’ll not only be able to see ‘Penalty’ for yourself, and hear from some of our fabulous actors, but you’ll enter into the world of that film as you check in to HOTEL UTOPIA. However, if you want to check out, there’s work to do and fun to be had. The event includes a reception drink, followed by a delicious 2-course meal, and an auction. Soft and hot drinks will be provided and you can bring your own for £2 corkage. As the evening progresses, you and your table will have to work out clues, crack codes and find keys that will lead to finally being able to escape. We delight in entertaining our audiences and our fund-raisers have always delivered an excellent evening. The money raised goes towards our next production, and we depend on these events to make our work possible. It’s very near Sainsbury’s and we can use their car park IF they can have car registration details a week in advance. Please let us know when you book. And if you can’t come, but would like to give a donation, we’d love to hear from you. Hopefully, we’ll see you there!